They definitely nailed the look of Ragnar Blackmane with this conversion. 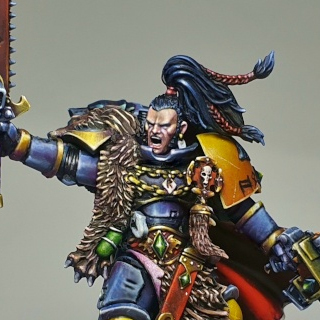 There have been several pretty good Ragnar conversion I've seen out there, because let's face it, the actual model for him is pretty dated. This is the first Primaris version of him I've seen though and it's pretty flawless. At first glance it definitely reads as Ragnar, but it also has all of the Primaris accouterments we've come to expect. His armor is updated and more simple, yet there's enough ornamentation to mark him out as special. It's the head, chainsword, backpack, and wolf pelt on his shoulder that really drive it home. I like that they've gone away from the metallic wolf head on the shoulder and went with a real one instead. It just looks cool. The paint job on this is pretty amazing too. It's bright and saturated, but still has a realistic feel to it. Everything is smooth and crisp, and the reflections on the armor are enough to grab your attention without hitting you over the head with it. 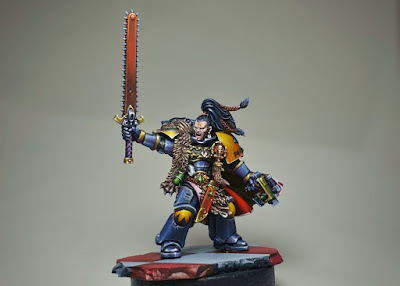 I'd love to see some more Primaris versions of older characters like this. Be sure to check out more views of it on Putty and Paint and show the artist some love if you like it!